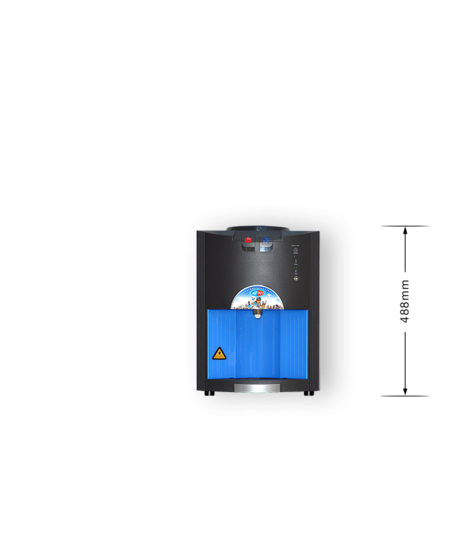 The future is in the Fusion: a new, cost reducing Desktop Mains Fed water dispenser that offers both chilled and boiling water in one streamlined, modern machine. This modern and stylish water dispenser complements most work areas, proving to be extremely popular in work environments of up to 10 – 15 people. This innovative machine offers a host of features: a proven energy consumption reduction of 25%; an integral cup dispenser, and the Hygiene Guard silver impregnated dispense tap reduces bacteria transfer and cross contamination. The Fusion Desktop Mains Fed water dispenser is also available as a Bottle Fed Free Standing and Mains Fed Free Standing water dispenser. The ECO Sensor reduces electricity usage by 25%, saving up to £40 per annum. Available as Free Standing and Desktop Bottle Fed and Mains Fed Free Standing water dispenser. Water Supply – 18ℓ per hour cold water supply. The installation of the AquAid Fusion Mains Fed Desktop Water Dispenser doesn’t just benefit you though. On average, every AquAid water cooler or dispenser installed will provide four people with water every year.